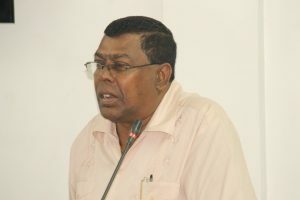 Head of the Guyana Police Force’s Office of Special Responsibility, Retired Assistant Commissioner, Heeralall Mackanlall. 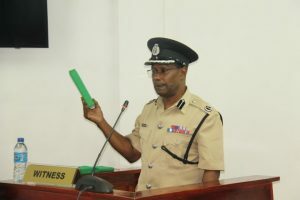 Head of the Guyana Police Force’s Office of Professional Responsibility (OPR), Retired Assistant Commissioner Heeralall Mackanlall on Tuesday said conceded that he was unable to eliminate or implicate the Joint Services in the killing of eight miners at Lindo Creek, Upper Berbice River 10 years ago. Attorney-at-Law for the Commission of Inquiry, Patrice Henry: Would you agree with me that at the end of your investigation you were unable to eliminate or implicate the Joint Services? Mr. Henry: So just as how the allegation surfaced or as you put it the rumour surfaced, at the end of the two weeks you were back to the same position; nothing useful came out. Mr. Mackanlall: That’s right, Sir. Now Retired Police Commissioner, Seelall Persaud, who had led the team of policemen to Christmas Falls on June 5, 2008, has already told the Commission of Inquiry that the Director of Public Prosecutions had requested that the case file be closed. Assistant Police Commissioner, Clifton Hicken said he and a party of policemen engaged several men, including one he recognised as wanted man, Rondell “Fineman” Rawlins at Christmas Falls. At the end of the 20 minute exchange of gunfire, he said several weapons and ammunition were found and one man was seen motionless. However, they did not pursue the men and instead returned to Georgetown because they were unaware of the terrain and were not prepared for the firepower that the five men had. “We were told to return to Georgetown. On our return to Georgetown, I did a brief because I was the tactical person there. I briefed the then Commissioner Greene and he alluded that the then Joint Services would take it from there. The reason for my brief was to let them understand the level of fire-power they are going against and what is expected so coming out of these briefs, you tool and then you deploy,” he said. Hicken said he was never at Lindo Creek and he does not know what the place looks like. He said for the remainder of June 2008, he was stationed at the Tactical Services Unit where he remained throughout that month. Mackanlall, then Deputy Head of OPR, told the Commission of Inquiry presided over by Retired Justice Donald Trotman that he had been assigned by the then Head, Retired Deputy Commissioner Mohammed Jameer to probe claims that the Joint Services had killed the miners at Lindo Creek. He said several persons and three security guards were questioned along the UNAMCO Road and check-point, as well as members of the Joint Services and relatives of the deceased whose names he could not remember but he was certain were in a report. 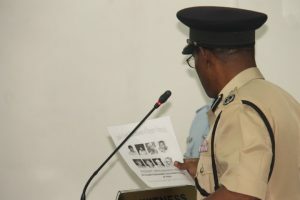 Assistant Commissioner of Police, Clifton Hicken looking at several pictures that were shown to him by Inquiry Commissioner, Retired Justice Donald Trotman. “I think that Ramsey put up a comprehensive report on this matter. I think CID prepared a file and I am aware Ramsey did the report,” said Mackanlall. Mackanlall said gold miner GeorgeArokium, whose son, Dax, perished in the massacre, had informed him that Yonnette Torres had claimed that police and soldiers killed the miners. However,Mackanlall said when Torres was questioned she denied ever saying so. During his testimony before the one-man presidential commission of inquiry, Mackanall, however, could not say where allegation of the involvement by police and soldiers originated from. “During my enquiry, I was unable where the rumours came from,” he said. Under examination by Attorney-at-Law for the Commission, Patrice Henry, the OPR Head said he was able to ascertain that the joint services was patrolling the Lindo Creek area but he could not remember the names of the 12 police and 11 soldiers. At that juncture of Tuesday’s hearing, it appeared that there was poor police recording and storage of information gathered during the course of the investigation of the criminal act. “I can’t remember the names of the ranks. I made notes on a scratch-pad that I had,” he said. When asked by the Inquiry Commissioner whether he had stored those names in a more permanent form such a s statement and if the then OPR Head, Jameer had ever asked him for them, Mackanlall responded “no, Sir”. He said the reason for that was that he was told that the Criminal Investigations Department was continuing the probe. The then Deputy Head of OPR also added that no report was submitted to then Head, Mr Jameer at the end of the investigation. “I should have done that,” he added. He recalled that records and statements had been handed over to Mr. Jameer and then Deputy Head of the Criminal Investigations Department, Mr. Crawford. He said the names of the joint services members should be at the Police Headquarters where the then headquarters of E and F Division was located. He, however, recalled that among the party were one Sewnarine who was in charge of the police team; Lieutenant Woolford who headed the Guyana Defence Force team and and Captain Souvenir who was in charge of the army’s Special Forces. Mackanlall said the three persons submitted statements as part of the probe. He added that the guns were tested by ranks of the Jamaica Constabulary Force and by a Guyanese Inspector Jackson who was under the supervision of Retired Senior Superintendent Thomas who was in charge of the Crime Laboratory at the times. However, Mackanlall said no spent shells were recovered from the scene and because one week had already passed, that time lapse had already eliminated the need for gun powder residue tests to be conducted on the hands of members of the joint services team. Further grilled by Justice Trotman on whether he had recorded in a book at OPR what had transpired during his investigations, Mackanlall said he did not do so because there was no book. “No such book in which would have recorded what transpired. No book, we had no book at OPR at that time. Subsequently, a book was opened to record complaints,” said Mackanlall, a former Head of the Criminal Investigations Department. The Head of OPR said he had never obtained any information from the Guyana Geology and Mines Commission whether there had been any nearby mining camps that had been granted permission. Assistant Commissioner of Police, Clifton Hicken taking the oath as a witness before the Lindo Creek Commission of Inquiry. Assistant Commissioner Hicken acknowledged that it was possible that other members of the Tactical Services Unit of which he was Head at the time, might have been part of a Joint Services team. Hicken said neither Mackanlall, anyone else from the OPR or CID ever questioned him about allegations made by civilians about his involvement at Lindo Creek. “No, Sir and it would have been unwise for him to ask me that,” Hicken told Justice Trotman. Hicken, who said he joined the team at Ituni, told the Commission that he had never gone to Christmas Falls before and had no clear of idea of where he was going, but at the same time ruled out that he was instead at Lindo Creek. “It could not have been Sir,” Hicken said while giggling. The now Assistant Police Commissioner, after he was shown photographs of the dead miners, was asked if they resembled members of the Fineman gang. “Not those who I encounter, No, Commissioner,” he said, when asked whether they resembled those gang members.